In the early power systems were mainly Neutral ungrounded due to the fact that the first ground fault did not require the tripping of the system. An unscheduled shutdown on the first ground fault was particularly undesirable for continuous process industries. These power systems required ground detection systems, but locating the fault often proved difficult. Although achieving the initial goal, the ungrounded system provided no control of transient over-voltages. A capacitive coupling exists between the system conductors and ground in a typical distribution system. As a result, this series resonant L-C circuit can create over-voltages well in excess of line-to-line voltage when subjected to repetitive re-strikes of one phase to ground. This in turn, reduces insulation life resulting in possible equipment failure. Neutral grounding systems are similar to fuses in that they do nothing until something in the system goes wrong. Then, like fuses, they protect personnel and equipment from damage. Damage comes from two factors, how long the fault lasts and how large the fault current is. Ground relays trip breakers and limit how long a fault lasts and Neutral grounding resistors limit how large the fault current is. Reduction in frequency of faults. 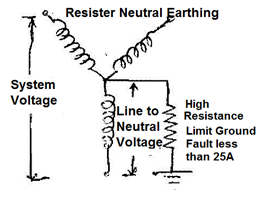 There are five methods for Neutral earthing. 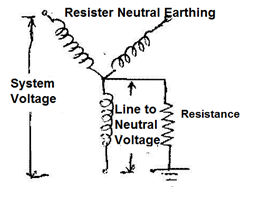 Resistance Neutral Earthing System.Resonant Neutral Earthing System. In ungrounded system there is no internal connection between the conductors and earth. However, as system, a capacitive coupling exists between the system conductors and the adjacent grounded surfaces. Consequently, the “ungrounded system” is, in reality, a “capacitive grounded system” by virtue of the distributed capacitance. Under normal operating conditions, this distributed capacitance causes no problems. In fact, it is beneficial because it establishes, in effect, a neutral point for the system; As a result, the phase conductors are stressed at only line-to-neutral voltage above ground. But problems can rise in ground fault conditions. A ground fault on one line results in full line-to-line voltage appearing throughout the system. Thus, a voltage 1.73 times the normal voltage is present on all insulation in the system. This situation can often cause failures in older motors and transformers, due to insulation breakdown. After the first ground fault, assuming it remains as a single fault, the circuit may continue in operation, permitting continued production until a convenient shut down for maintenance can be scheduled. The interaction between the faulted system and its distributed capacitance may cause transient over-voltages (several times normal) to appear from line to ground during normal switching of a circuit having a line-to ground fault (short). These over voltages may cause insulation failures at points other than the original fault. A second fault on another phase may occur before the first fault can be cleared. This can result in very high line-to-line fault currents, equipment damage and disruption of both circuits. The cost of equipment damage. Complicate for locating fault(s), involving a tedious process of trial and error: first isolating the correct feeder, then the branch, and finally, the equipment at fault. The result is unnecessarily lengthy and expensive down downtime. 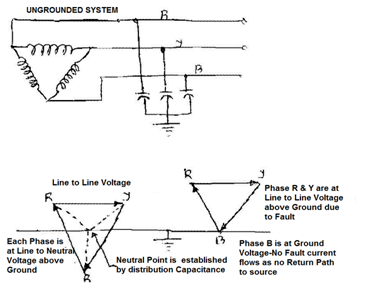 Solidly grounded systems are usually used in low voltage applications at 600 volts or less. In solidly grounded system, the neutral point is connected to earth. Solidly Neutral Grounding slightly reduces the problem of transient over voltages found on the ungrounded system and provided path for the ground fault current is in the range of 25 to 100% of the system three phase fault current. However, if the reactance of the generator or transformer is too great, the problem of transient over voltages will not be solved. While solidly grounded systems are an improvement over ungrounded systems, and speed up the location of faults, they lack the current limiting ability of resistance grounding and the extra protection this provides. If the system is not solidly grounded, the neutral point of the system would “float” with respect to ground as a function of load subjecting the line-to-neutral loads to voltage unbalances and instability. The single-phase earth fault current in a solidly earthed system may exceed the three phase fault current. The magnitude of the current depends on the fault location and the fault resistance. One way to reduce the earth fault current is to leave some of the transformer neutrals unearthed. The main advantage of solidly earthed systems is low over voltages, which makes the earthing design common at high voltage levels (HV). This system involves all the drawbacks and hazards of high earth fault current: maximum damage and disturbances. There is no service continuity on the faulty feeder. The danger for personnel is high during the fault since the touch voltages created are high. Use of the neutral conductor as a protective conductor with systematic earthing at each transmission pole. Used when the short-circuit power of the source is low. Resistance grounding has been used in three-phase industrial applications for many years and it resolves many of the problems associated with solidly grounded and ungrounded systems. To reduce burning and melting effects in faulted electrical equipment like switchgear, transformers, cables, and rotating machines. To reduce mechanical stresses in circuits/Equipments carrying fault currents. To reduce electrical-shock hazards to personnel caused by stray ground fault. To reduce the arc blast or flash hazard. To reduce the momentary line-voltage dip. To secure control of the transient over-voltages while at the same time. To improve the detection of the earth fault in a power system. Grounding Resistors are generally connected between ground and neutral of transformers, generators and grounding transformers to limit maximum fault current as per Ohms Law to a value which will not damage the equipment in the power system and allow sufficient flow of fault current to detect and operate Earth protective relays to clear the fault. Although it is possible to limit fault currents with high resistance Neutral grounding Resistors, earth short circuit currents can be extremely reduced. As a result of this fact, protection devices may not sense the fault. Therefore, it is the most common application to limit single phase fault currents with low resistance Neutral Grounding Resistors to approximately rated current of transformer and / or generator. In addition, limiting fault currents to predetermined maximum values permits the designer to selectively coordinate the operation of protective devices, which minimizes system disruption and allows for quick location of the fault. Ground fault current flowing through either type of resistor when a single phase faults to ground will increase the phase-to-ground voltage of the remaining two phases. As a result, conductor insulation and surge arrestor ratings must be based on line-to-line voltage. This temporary increase in phase-to-ground voltage should also be considered when selecting two and three pole breakers installed on resistance grounded low voltage systems. Neither of these grounding systems (low or high resistance) reduces arc-flash hazards associated with phase-to-phase faults, but both systems significantly reduce or essentially eliminate the arc-flash hazards associated with phase-to-ground faults. Both types of grounding systems limit mechanical stresses and reduce thermal damage to electrical equipment, circuits, and apparatus carrying faulted current. The difference between Low Resistance Grounding and High Resistance Grounding is a matter of perception and, therefore, is not well defined. Generally speaking high-resistance grounding refers to a system in which the NGR let-through current is less than 50 to 100 A. 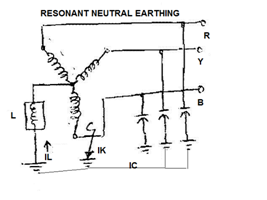 Low resistance grounding indicates that NGR current would be above 100 A. A better distinction between the two levels might be alarm only and tripping. An alarm-only system continues to operate with a single ground fault on the system for an unspecified amount of time. In a tripping system a ground fault is automatically removed by protective relaying and circuit interrupting devices. Alarm-only systems usually limit NGR current to 10 A or less. 1. Voltage: Line-to-neutral voltage of the system to which it is connected. 2. Initial Current: The initial current which will flow through the resistor with rated voltage applied. 3. Time: The “on time” for which the resistor can operate without exceeding the allowable temperature rise. A resistor is connected from the system neutral point to ground and generally sized to permit only 200A to 1200 amps of ground fault current to flow. Enough current must flow such that protective devices can detect the faulted circuit and trip it off-line but not so much current as to create major damage at the fault point. Since the grounding impedance is in the form of resistance, any transient over voltages are quickly damped out and the whole transient overvoltage phenomena is no longer applicable. Although theoretically possible to be applied in low voltage systems (e.g. 480V),significant amount of the system voltage dropped across the grounding resistor, there is not enough voltage across the arc forcing current to flow, for the fault to be reliably detected. For this reason, low resistance grounding is not used for low voltage systems (under 1000 volts line to-line). Limits phase-to-ground currents to 200-400A. Reduces arcing current and, to some extent, limits arc-flash hazards associated with phase-to-ground arcing current conditions only. May limit the mechanical damage and thermal damage to shorted transformer and rotating machinery windings. Does not prevent operation of over current devices. Does not require a ground fault detection system. May be utilized on medium or high voltage systems. Conductor insulation and surge arrestors must be rated based on the line to-line voltage. Phase-to-neutral loads must be served through an isolation transformer. Used: Up to 400 amps for 10 sec are commonly found on medium voltage systems. 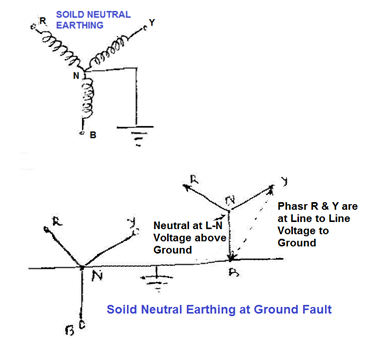 High resistance grounding is almost identical to low resistance groundingexcept that the ground fault current magnitude is typically limited to 10 amperes or less. High resistance grounding accomplishes two things. The first is that the ground fault current magnitude is sufficiently low enough such that no appreciable damage is done at the fault point. This means that the faulted circuit need not be tripped off-line when the fault first occurs. Means that once a fault does occur, we do not know where the fault is located. In this respect, it performs just like an ungrounded system. The second point is it can control the transient overvoltage phenomenon present on ungrounded systems if engineered properly. 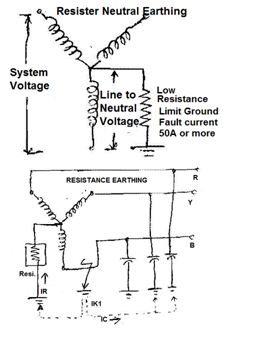 High Resistance Grounding (HRG) systems limit the fault current when one phase of the system shorts or arcs to ground, but at lower levels than low resistance systems. In the event that a ground fault condition exists, the HRG typically limits the current to 5-10A. HRG’s are continuous current rated, so the description of a particular unit does not include a time rating. Unlike NGR’s, ground fault current flowing through a HRG is usually not of significant magnitude to result in the operation of an over current device. Since the ground fault current is not interrupted, a ground fault detection system must be installed. These systems include a bypass contactor tapped across a portion of the resistor that pulses (periodically opens and closes). When the contactor is open, ground fault current flows through the entire resistor. When the contactor is closed a portion of the resistor is bypassed resulting in slightly lower resistance and slightly higher ground fault current. To avoid transient over-voltages, an HRG resistor must be sized so that the amount of ground fault current the unit will allow to flow exceeds the electrical system’s charging current. As a rule of thumb, charging current is estimated at 1A per 2000KVA of system capacity for low voltage systems and 2A per 2000KVA of system capacity at 4.16kV. These estimated charging currents increase if surge suppressors are present. Each set of suppressors installed on a low voltage system results in approximately 0.5A of additional charging current and each set of suppressors installed on a 4.16kV system adds 1.5A of additional charging current. A system with 3000KVA of capacity at 480 volts would have an estimated charging current of 1.5A.Add one set of surge suppressors and the total charging current increases by 0.5A to 2.0A. A standard 5A resistor could be used on this system. Most resistor manufacturers publish detailed estimation tables that can be used to more closely estimate an electrical system’s charging current. Some phase-to-earth faults are self-cleared. The neutral point resistance can be chosen to limit the possible over voltage transients to 2.5 times the fundamental frequency maximum voltage. Limits phase-to-ground currents to 5-10A. Reduces arcing current and essentially eliminates arc-flash hazards associated with phase-to-ground arcing current conditions only. Will eliminate the mechanical damage and may limit thermal damage to shorted transformer and rotating machinery windings. Prevents operation of over current devices until the fault can be located (when only one phase faults to ground). May be utilized on low voltage systems or medium voltage systems up to 5kV. IEEE Standard 141-1993 states that “high resistance grounding should be restricted to 5kV class or lower systems with charging currents of about 5.5A or less and should not be attempted on 15kV systems, unless proper grounding relaying is employed”. Generates extensive earth fault currents when combined with strong or moderate capacitive connection to earth Cost involved. Requires a ground fault detection system to notify the facility engineer that a ground fault condition has occurred. Adding inductive reactance from the system neutral point to ground is an easy method of limiting the available ground fault from something near the maximum 3 phase short circuit capacity (thousands of amperes) to a relatively low value (200 to 800 amperes). To limit the reactive part of the earth fault current in a power system a neutral point reactor can be connected between the transformer neutral and the station earthing system. Petersen coil / Arc Suppression Coil / Earth Fault Neutralizer. The current generated by the reactance during an earth fault approximately compensates the capacitive component of the single phase earth fault current, is called a resonant earthed system. The system is hardly ever exactly tuned, i.e. the reactive current does not exactly equal the capacitive earth fault current of the system. However, experience indicated that this inductive reactance to ground resonates with the system shunt capacitance to ground under arcing ground fault conditions and creates very high transient over voltages on the system. To control the transient over voltages, the design must permit at least 60% of the 3 phase short circuit current to flow underground fault conditions. Example. A 6000 amp grounding reactor for a system having 10,000 amps 3 phase short circuit capacity available. Due to the high magnitude of ground fault current required to control transient over voltages, inductance grounding is rarely used within industry. A Petersen Coil is connected between the neutral point of the system and earth, and is rated so that the capacitive current in the earth fault is compensated by an inductive current passed by the Petersen Coil. A small residual current will remain, but this is so small that any arc between the faulted phase and earth will not be maintained and the fault will extinguish. Minor earth faults such as a broken pin insulator, could be held on the system without the supply being interrupted. Transient faults would not result in supply interruptions. Although the standard ‘Peterson coil’ does not compensate the entire earth fault current in a network due to the presence of resistive losses in the lines and coil, it is now possible to apply ‘residual current compensation’ by injecting an additional 180° out of phase current into the neutral via the Peterson coil. The fault current is thereby reduced to practically zero. Such systems are known as ‘Resonant earthing with residual compensation’, and can be considered as a special case of reactive earthing. Resonant earthing can reduce EPR to a safe level. This is because the Petersen coil can often effectively act as a high impedance NER, which will substantially reduce any earth fault currents, and hence also any corresponding EPR hazards (e.g. touch voltages, step voltages and transferred voltages, including any EPR hazards impressed onto nearby telecommunication networks). Small reactive earth fault current independent of the phase to earth capacitance of the system. Enables high impedance fault detection. Risk of extensive active earth fault losses. In such cases the impedance of the earthing transformer may be sufficient to act as effective earthing impedance. Additional impedance can be added in series if required. A special ‘zig-zag’ transformer is sometimes used for earthing delta windings to provide a low zero-sequence impedance and high positive and negative sequence impedance to fault currents. Resistance Grounding Systems have many advantages over solidly grounded systems including arc-flash hazard reduction, limiting mechanical and thermal damage associated with faults, and controlling transient over voltages. High resistance grounding systems may also be employed to maintain service continuity and assist with locating the source of a fault. When designing a system with resistors, the design/consulting engineer must consider the specific requirements for conductor insulation ratings, surge arrestor ratings, breaker single-pole duty ratings, and method of serving phase-to-neutral loads. By Michael D. Seal, P.E., GE Senior Specification Engineer.